As the fourth of July nears and our plans for a burger on the grill emerge, be prepared, the propagandists are in full force to get you giddy on irradiated beef. In December of 1997 the FDA approved irradiation of meat, the press release from the Health and Human Services says that the Clinton Administration took these positive steps "to reduce the number of consumers suffering from food-borne pathogens" also known as "because the government loves you," or simply, "the loving". Food irradiation has been attacking our food supply since the 1950's. First, they needed to test it out on the US Army, and began irradiating fresh food for the troops. When that was perfected they rolled it out for the rest of us, irradiating first our spices, fruits and vegetables, that was to slow spoilage, then in 1985 the FDA approved irradiating pork, then poultry, next of course was beef. The plot to get Americans scoffing the irradiated beef could have been pulled right from the pages of Bernays' Propaganda. The beef has an extended shelf life of twenty one days and because there is nothing living on the meat, you get to "cook it the way you like it," a key point highlighted on the local news. During their recipe segment, NBC 34 in New York makes BBQ burgers, and they call for "*Irradiated Fresh Ground Beef". 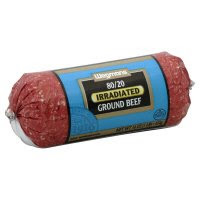 With a warning for your safety, " * If using non-irradiated ground beef, cook to 160 degrees. " At the local market the story was no different. Packaged just like the more expensive organic beef, the irradiated Wegmans beef looked irresistible to a fellow shopper, and as he eyed it I asked, "irradiated beef, what does that mean?" the gentlemen parroted their propaganda, "its to keep the meat safe, no bacteria" he was a little unsure and ran off leaving his beef behind. It is working. Sadly we are not just up against e coli and listeria. We are up against a US defense contractor. Titan Corporation (now known as L-3) created SureBeam Meat Sanitizer, one of the first irradiation devices to pasteurize ground beef. "Titan (L-3) is a leading provider of comprehensive information and communications products, solutions, and services for National Security and the Security of our Homeland. Serving the Department of Defense, intelligence agencies, and other government customers." This is where the campaign to get Americans to eat irradiated beef is coming from. "Dr. Ray served for two years as Chief, Strategic Division, U.S. Air Force (AFGOAS). He held the position of Senior Appointee (Public Law 313) on the staff of the chief of Staff of the U.S. Air Force, where he led a team of military and civilian analysts and scientists. Earlier in his career, Dr. Ray was with the Aerospace Corporation where he contributed to weapon system analysis programs and specialized in the area of nuclear survivability." Dr. Ray was interviewed by "Food Tech Source" and tells of an America where parents will not allow their children to eat anything unless it has been irradiated. He then goes on to say that there are "no meaningful downsides to irradiation", no more than milk pasteurization, that is. Ignoring the downsides to milk pasteurization, and there are many and they are substantial, according to the Weston A. Price Foundation "pasteurized milk destroys enzymes, diminishes vitamin content, denatures fragile milk proteins, destroys vitamins C, B12 and B6, kills beneficial bacteria, promotes pathogens and is associated with allergies, increased tooth decay, colic in infants, growth problems in children, osteoporosis, arthritis, heart disease and cancer. Calves fed pasteurized milk do poorly and many die before maturity." Hundreds of thousands of people have been sick because of pasteurization since it has been implemented. It was a quick fix, raw milk sours too quickly to yield a large profit. Pasteurization allowed for large dairy farms to sell older milk, and keep it on the shelves longer. Just like irradiation. It will not matter what condition meat is in before it is irradiated, it does not matter how the cow is treated or slaughtered or handled, it can be old and dirty, and once it has been irradiated its perfect for you the consumer, and great for the market, it gains a huge window to make the sale, 21 days before it is deemed inedible. Less waste. Our food is being depleted of nutrients, by design and our immune systems are being attacked, the timing is perfect, as super flu's are being unleashed. Its all being called safety, and its all being done to protect us.